In TouchPoint, Pledges are designed for campaigns that will have an end date and that the Fund will be closed at the end of the campaign. If you do not want to close the Pledge Fund, you can remove the Pledge Fund check mark and leave the Fund open and the Pledges to that Fund will no longer display on the statement. See Special Setting below for another exception regarding open Funds and Pledges. To make a Fund a Pledge Fund, check the box Pledge Fund? on the Edit page for the Fund in Fund Management. You do not create one Fund for recording Pledges and another for recording actual Contributions. You use the same Fund for both. To start a new Pledge campaign, create a new Fund. Donors can contribute to a Pledge Fund even though they have not made a Pledge. We recommend that you post Pledges in separate Bundles from Bundles with Contributions. In other words, do not mix Pledges and Contributions in the same Bundle. When posting Pledges use the Bundle Type of Pledge. TouchPoint has a function for allowing donors to make Pledges online. A gift of stock or a gift-in-kind can be to reduce the balance on a Pledge. Pledges display in a special section on a Contribution Statement, and will display as long as the Fund remains open or as long as you have the Fund flagged as a Pledge Fund. See Special Setting below. A Pledge can be increased at any time by recording an additional Pledge. So, the total Pledge amount for a donor will be the total amount of Pledges toward a given Fund. If a donor makes an additional Pledge to the same Fund, the total Pledge amount will display on the Contribution Statement, not 2 separate Pledges. A Contribution Statement will display a Pledge section only for those donors with Pledges. A Statement will not display that a person has a zero Pledge. Once a Fund is closed, Pledges will no longer display on the statement, even if the Pledge was not met. In the Pledge section of the statement, the Amount Given will be the total since the Pledge began, even if that pre-dates the period of the Statement. However, the Summary Totals section will display the amount given that year (during the period of the Statement). The Pledge Fulfillment Report is an Excel spreadsheet showing all donors with Pledges and how much has been given toward the Pledge. The Pledge Report shows summary totals for open Pledge Funds. The Pledge Totals by Range Report breaks down Pledges by the amount of the Pledge. Look on the Contributions tab in Search Builder for more Conditions relating to Pledges. 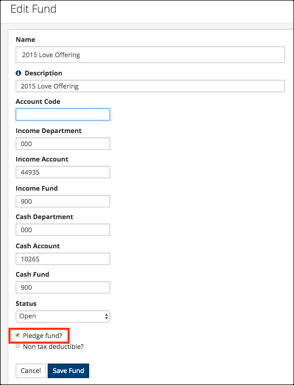 If your church wants to stop displaying Pledges on Contribution Statements once the donor has fulfilled their Pledge, your TouchPoint Admin can add a setting ID named ShowPledgeIfMet and make the setting False. This is designed especially for churches that have existing Pledges to Funds that will not be closed at the time they become a client of TouchPoint. Example: a Pledge campaign for the Budget Fund. 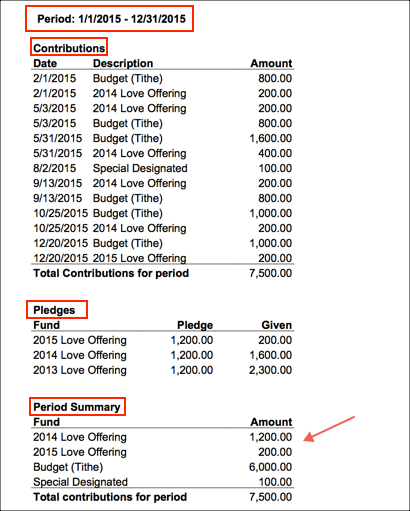 A church has a new love offering Fund every year for which people make Pledges - Love Offering 2013; Love Offering 2014; and so forth. The church will keep each Fund open for a couple of years allowing donors to continue contributing toward it, in case they did not complete their Pledge during that year. At some point, the oldest Pledge Fund will be closed, and Pledge information for that Fund will no longer print on the donor’s Contribution Statement.